Professor Reilly received his A.B., Chemistry, from Princeton University in 1972. He completed his PhD in Physical Chemistry at the University of California, Berkeley in 1977. He served as a postdoctoral fellow in 1978 at Max-Planck under the tutelage of Gesellschaft Zur Forderung Der Wissenschaften. 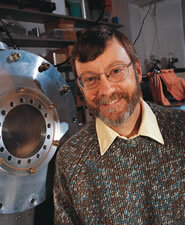 Professor Reilly has been a member of the Indiana University, Department of Chemistry, faculty since 1979. In addition Professor Reilly was selected to be the recipient of the Alfred P. Sloan Fellowship in 1982; Camille and Henry Dreyfus Teacher-Scholar Award, 1983; in 1998 and 1999, he received an Indiana University Departmental Teaching Excellence Award; and more recently, he received an Indiana University Trustee Teaching Award in 2005.